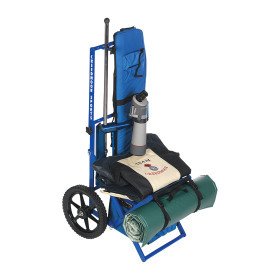 Creedmoor Range Cart, Stools & Range Carts: Creedmoor Sports Inc.
* Select Rifle Case : 41" 48" 52"
Loctite Threadlocker Blue 242 is designed for the locking and sealing of threaded fasteners which require normal disassembly with standard hand tools. The product cures when confined in the absence of air between close fitting metal surfaces. It protects threads from rust and corrosion and prevents loosening from shock and vibration. Loctite Threadlocker Blue 242 is particularly suited for applications on less active substrates such as stainless steel and plated surfaces, where disassembly is required for servicing. Solid 14" rubber wheels with bearings (no more flat tires). No tools required for assembly or stowage Machined from solid aluminum stock (not tubing) No welded parts on cart. Scope Stand (not included) remains on cart for standing position and scorekeeping. Foldable handle for easy transport in back of vehicle. Cart folds with the simple lifting of a locking lever Pull 4 pins, and loosen two butterfly knobs and the cart can be stowed in a 30" suitcase. Collapses into an area 30 x 17 x 8 inches with no tools and in less than 1 minute. Removable rifle case that doubles as a rack/holster. Lower center of gravity makes cart more stable on uneven terrain. Each cart comes standard with frame, stool bag, scope stand holder, rifle case, rain cover, ammo/data book tray, shooting mat straps, and now a rifle rack. -Your choice of a 41", 48" or 52" blue Creedmoor rifle case. -Data book table (tray) that can be secured either to your 1" scope stand or the side of the range cart as well as used in placed on the ground to keep ammo and data books clean and dry. 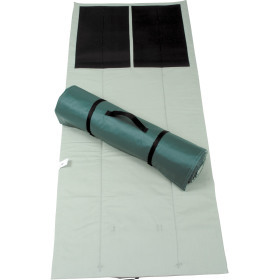 -Water-resistant rain cover that covers the range cart top to bottom. -Rifle Rack Mount that works with any length or type of rifle. 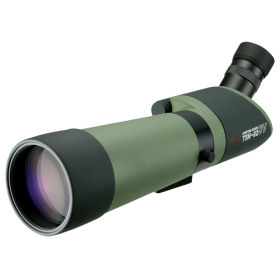 Scope mounts are not compatible with C1010 and C1011 scope stands. This cart is far sturdier than I had expected, and heavier. The fabrication of the components, the hardware, the solid, strong wheels; all indications to me that this was a good buy that should last for life. The only negative comments- the locking bar needed a bit of fitting, and, oddly, the locating/holding pin for the bottom of the scope stand is not aligned with the center of the scope mount clamp. Also, I had to fabricate a support for the bottom of the rifle case to keep it from dragging on the ground, unless I mounted it incorrectly. Owner Response: Thank you for taking time to review our range cart. If you have a broken wheel, we will gladly replace it. Just give us a call. We chose not to use pneumatic wheels because the cart is prepared to go anywhere on the range and needs to be able to travel on rough terrain. Again, we'll be happy to replace your wheel if you email us directly at shoot@creedmoorsports.com . We look forward to working with you again soon. Purchased the Cart after seeing them at Camp Perry and realizing what a great cart they were. I had a small issue with threads and called the Company and they sent right out the new parts to replace the ones that were faulty due to Paint in the threads which caused a issue. I would Highly recommend this Company as they certainly were very responsive! Purchased the range cart back in 2009. So I've had about 8 years of experience with it and the cart has seen many miles out on the range. First off it's of suberb design and construction. The main reason I purchased the cart was it's ability to collapse and readily fit in the trunk of the car. It will take about 1 minutes to collapse and about 3 minutes or less to reconfigure for range use.... One of the best features is the ability to attach the soft bag rifle case. When you're finished shooting on the line simply place the ECI indicator in the rifle and drop the rifle in the bag. Barrel pointed down towards the ground and no issues with the RO. The cart pushes or pulls easily over ruff terrain. 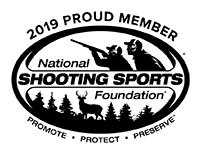 The tray attached for the standing position is very useful and is reminiscent of shooting smallbore in the standing position.... Each year at the beginning of the season I check the bolts for tightness and check the wheels/bearings. The only recommendation I have is to carry a couple extra, screws, lymch pins and wheel nuts, in case you loose one; for me it hasn't been a problem. The cart is excellent for both EIC and NRA matches. If you're shooting a space gun you'll need the side mount attachments for the rifle, due to rifle length..... If reliability, longevity, convenience and ease of use is what you're looking for, the cart will serve you well for many years without issue. In my opinion the cart is well worth the money. I've had my cart for several years but I wanted to put in some solid use before reviewing. I am extremely pleased with my purchase. I was apprehensive given the cost but after owning and using it, i would spend the money again. No question. It's stable, easy to push around (I lost my right hand in Iraq and that was definitely a requirement!!) and fits into a large suitcase for travel. I fly with mine at least twice a year and use it several times a month, if it will survive airline baggage handlers it'll survive even the hardest Range use!. I did replace the push pins with Clevis pins with spring clips and then went to SS socket cap bolts with nylock nuts. The original pins had a tendency to work themselves out on rare occasions. The clevis pins were good enough but I like the security of the nyloc nuts, I'm OCD about my gear. Overall, I'm very happy with my cart and look forward to many more years with it. It, like every Creedmoor product has been exceptional in quality and customer service. Mr. DeMille has always taken the time to answer all of my questions and has gone above and beyond to help. I appreciate it very much! 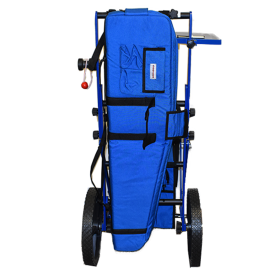 The Creedmore Range Cart is doubtless a high quality cart. Powder coated Aluminum with heavy fasteners and canvass materials will surely last over time. Assembly is generally very easy, but I have some comments and needs for clarification. Should I send a separate message? Owner Response: Thank you for your question. Yes, feel free to email us at techsupport@creedmoorsports.com . This cart was pretty simple to put together and is comprised of high quality components. Overall the best option for a high power range cart on the market. Held up to a week at Camp Perry and made life on the line a lot easier than the converted stroller I used to have. I like all the accessories and it is well constructed. That said, it isn't perfect - there isn't such a thing out there. It would be really nice if the zippers on the stool bag were bigger so you could more easily access the main storage, maybe add top access. As designed it's a bit of a pain. Also, it would be nice if there were 2 "lock" bars to stabilize the front legs instead of one. Owner Response: Thank you for your review. We will forward your requests to our design team. We do appreciate your input. This is a great cart. Easy to assemble and break down. The frame is very strong. I am glad that I finally purchased one. Extremely well made and designed. Shipped quickly. Had a question, it was answered timely and by the design himself!! He was gracious and honest, (don't find that much anymore...) As a new shooter, I find the cart easy to setup and use. Would highly recommend! Absolutely The Best Cart! Period! Used this during the All Navy/LANTFLT matches. Absolutely terrific cart. Based on 9 days of use, I'll be buying one. I can't imagine a better product and the other 1 start review is ridiculous. Have not received this item yet, so cannot review it. Was told it's on backorder. Owner Response: Thank you for your comments. Yes, it is on back order right now. We are hoping to have them very soon though. Hoping to have them first part of January if not sooner.